After all the hype and promo stills, Legend of Zu 蜀山戰紀之劍俠傳奇 is finally out. Fans of Journey of Flower might remember that through an unexpected chain of events, Zanilia Zhao Li Ying's character Hua Qian Gu was appointed as the Leader of Zu. 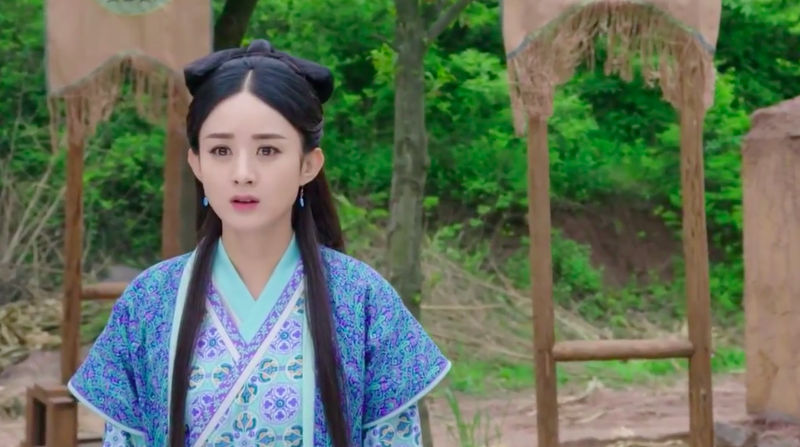 Hence, it's quite interesting to see her in a drama that is practically in the same magical realm but hey, if it can break records like Journey of Flower did, why not. Episode 1 begins with a backstory about the Chi Hun Stone, an incarnation of 81 ancient warriors that manifests its powers every 24 years. It is said that whoever has the stone can attain unimaginable strength but anyone weaker will perish at its presence. For thousands of years, the stone wreaked havoc until a man learned to control it and established the Sword Sect of the Zu Mountain. To maintain peace, it became the sect's sacred duty to safeguard the Chi Hun Stone. Another 240 years pass and it is time for the appointment of the next leader of Zu. However, Shang Guan Jing Wo (Nicky Wu), a student who has been imprisoned for years disrupts the ritual with the stone in tow. Fortunately, the new sect leader Zhu Ge Yu Wo was able to recover most of the Chi Hun Stone except for a missing piece and the sword fighting ends as Jing Wo and his pregnant wife jump off a cliff. 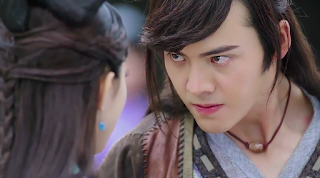 Another 24 years later and we are finally introduced to the main couple Ding Da Li (William Chan) and Xiao Yu (Zanilia Zhao Yi Ling). 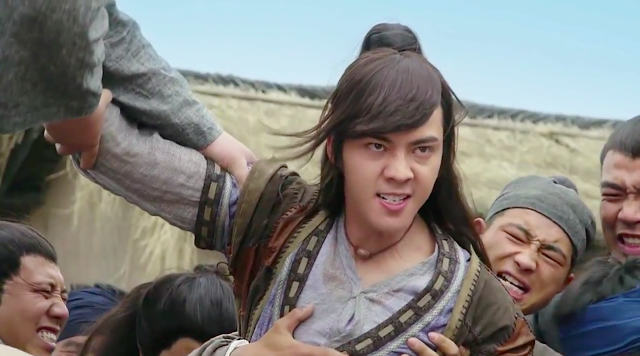 Da Li is in a rampant rage and the villagers try desperately to hold him down. It seems to be a strange yet common occurrence for everyone involved and Da Li only regains his senses after seeing his wife Xiao Yu. First Impressions: Episode 1 was all over the place but I try to be forgiving since I understand there's a necessary process to setup the story. 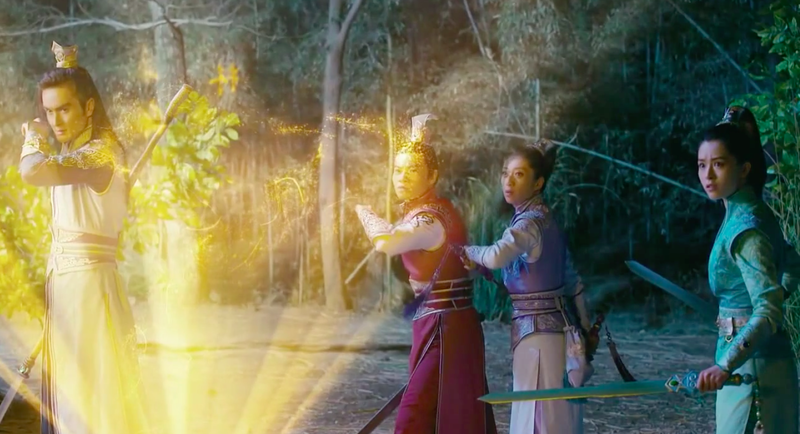 The plot is a repeat of Sword of Legends and Legend of Qin where the main character has to cope with an evil within. I get the appeal because I personally would always want to root for the struggling underdog but I hope they either do something different or make it exceptionally good because otherwise, it's getting old. 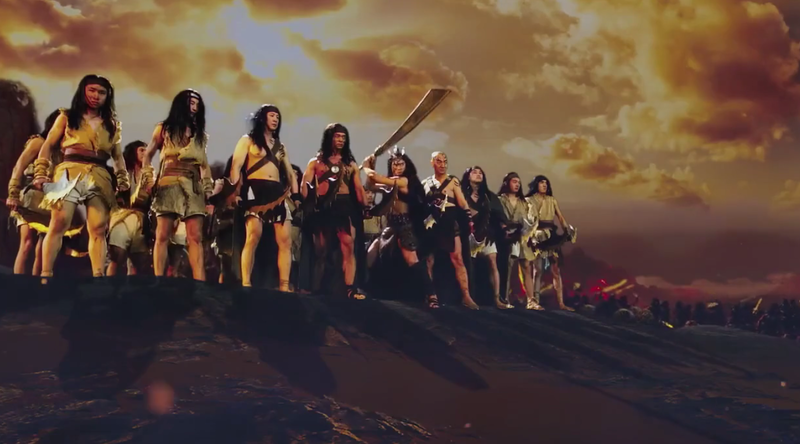 I'm usually not this harsh so I wonder if my imagination is simply running wild because firstly, the opening scene reminded me of the movie 300 without the abs. 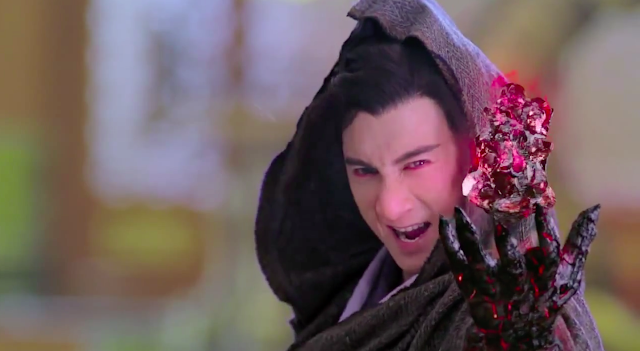 Then I thought Nicky Wu in a cape was a Sith Lord. And what is up with the multi-colored outfits? It's like Power Rangers with plastic swords and overused CGI effects. Nevertheless, I will probably keep watching because I like all the main leads and whoever plays Green below, she is is very pretty. For more Chinese drama recommendations, click here.